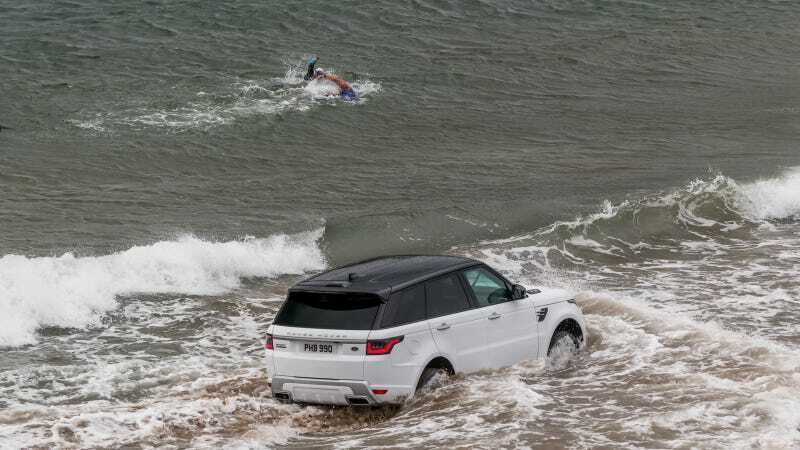 The first plug-in hybrid Range Rover reacted to news that it was good for the planet by attacking the ocean, apparently. Just a month after announcing that every new car after 2020 will be electrified, Land Rover has announced its first-ever production plug-in hybrid for the U.S. with the new Range Rover Sport. The 2019 Range Rover Sport will be available with four power options; either a supercharged V6, supercharged V8, turbo V6 diesel and now a plug-in hybrid setup with a 2.0-liter four-cylinder. The new plug-in makes use of a 296 horsepower 2.0-liter four-cylinder engine coupled with a 85 kW electric motor good for 114 horsepower, totaling just about 400 horsepower altogether and 472 lb-ft of torque. Top speed is 137 mph with a 0-60 time of 6.7 seconds, and the fully electric mode, one of two driving modes, has a claimed range of 31 miles. Evidently the hybrid Range Rover Sport, which will be badged the P400e based on the company’s new naming structure, will utilize a permanent four-wheel drive system in both normal and electric driving modes. The P400e goes on sale summer 2018 in the U.S. for the 2019 model year, but the 2018 model year Rangie Sport is also getting updates before they hybrid shows up. This update includes a touched up design, a new dual-10-inch-screen infotainment system, gesture-controlled sun blinds, 14 power points on the interior, and now you can option for Land Rover’s “activity key” that let’s you leave the key fob at home. Also updated for the 2018 model year is the Range Rover Sport SVR, which gets a power boost up to 575 horsepower and a slight shave off of the 0-60 time, which is now 4.3 seconds. Pricing for the 2019 hybrid model will start at $78,300, and the combined MPG hasn’t been announced yet.